We recently came back from a wonderful stay in Santorini one of the outstandingly beautiful Cyclades islands. I’m more than confident that you have heard of this beautiful island many times before. Santorini’s cliffside villages are crammed with heavenly whitewashed buildings and blue domes, luxury villas and apartments with infinity pools. It’s a bloggers paradise and on many, many “see before I die” lists. We decided to travel in May, whilst the weather was still fair and the prices reasonable.We headed over to Santorini after hopping on a short flight from Athens. Having flown all over the world this is by far the smallest airport I have ever been in! Don’t expect to be moving in a hurry if you’re collecting bags! We hired a car, which I would strongly recommend – although this is a small island, the roads are not particularly suitable for walking between villages. Amber Light Villas can be found down a steep winding track, nestled in the rural hillside. Once we arrived we parked in the small car park above the resort and walked down to the reception. We stayed in a standard room with hot tub on terrace. 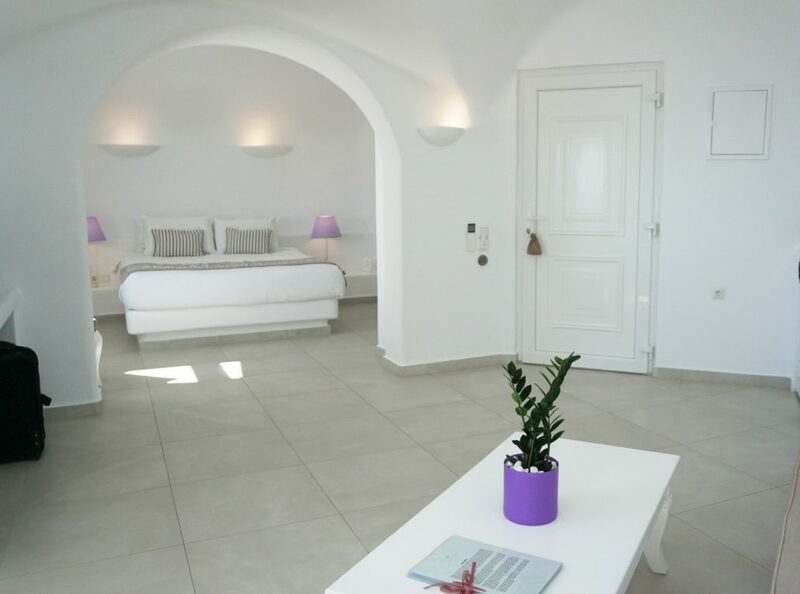 The rooms are gorgeous, with the authentic Greek theme; airy, white washed with a splash of lavender accents for a touch of modernity. The balcony is well shielded from other rooms with high walls and a canopy above the hot tub. The bathroom featured a rainforest style shower – something I really struggled to convince myself to step out of! I am a huge foodie and breakfast did not disappoint, local pastries alongside standard continental buffet breakfast fixtures – fresh fruit, breads, preserves, cereals, pastries and hot foods such as bacon, eggs, and sausages. Whilst this resort definitely requires a car the location is perfect, a area of solace away from the hustle and bustle of the more popular tourist locations. Definitely a huge recommendation from me! You can view current prices on booking.com: Amber Light Villas.